Students protesting around the Starbucks at the student union holding signs about their concerns. Two videos of black men being gunned down by police have again galvanized the U.S. in a debate about what is or is not wrong with policing in the country. Police violence can be thought of as an open wound in the black community; before any healing begins, another video surfaces and reopens it. 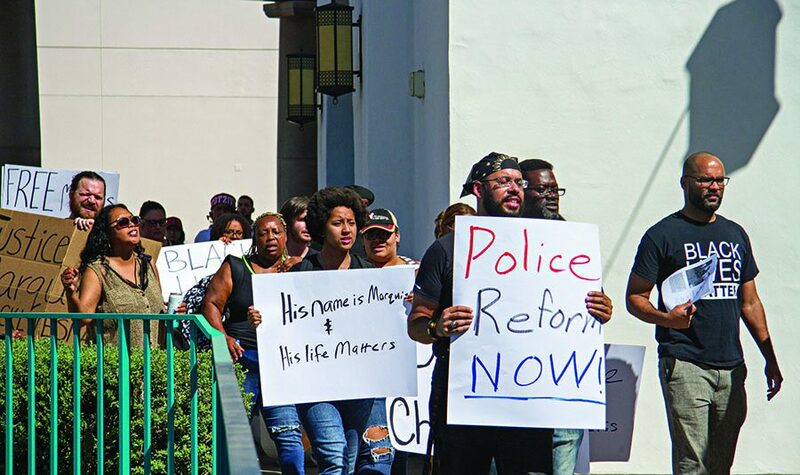 Students found out on Sept. 15 that San Diego State is not untouched by this issue when Marquis Campbell was arrested by SDSU Police outside the Conrad Prebys Aztec Student Union Starbucks. The video spread rapidly and soon protesters from the Afrikan Student Union gathered at Manchester Hall, demanding a response from President Hirshman. A second protest on Sept. 26 drew students and community activists who demanded charges be dropped against Campbell. Campbell, who is not a student, was charged with four misdemeanors: two charges of resisting an officer and two more serious, if not redundant, charges of resisting an executive officer. Campbell is still in San Diego County Jail, his bail set at $20,000. Protesters demanded on Monday these charges against Campbell be dropped. His grandmother addressed the crowd and said his arrest was reminiscent of the larger issues people of color have with law enforcement nationwide. Police departments were used as the enforcement arm of American white supremacy for decades. From slave patrols to Jim Crow, black resistance was often met with violence and death, either at the hands of or with the consent of law enforcement. Things began to change with the emergence of television. Images of police viciously beating black protesters and turning fire hoses and dogs on them led to broader support of reform and, eventually, the civil and voting rights acts. Studies have shown American communities of color are policed differently than others. 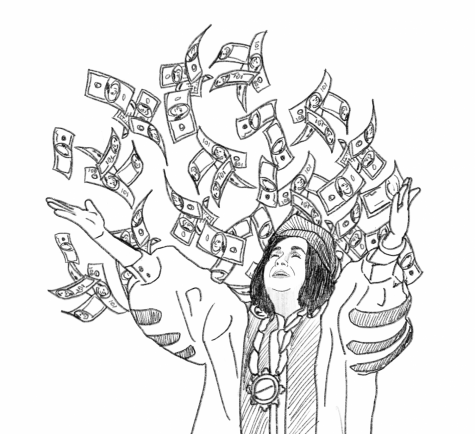 A Justice Department investigation of Ferguson, Missouri found the police department functioned as a revenue-generator, ticketing residents at high rates for minor violations. Broken-windows policing, a strategy in which officers strictly enforce minor offenses to prevent larger ones, targeted these communities and only fostered resentment. Stop-and-frisk, an unconstitutional practice that encourages racial profiling, has reemerged as a major issue in the current presidential race. Some communities have even criminalized sagging pants. Terrebonne Parish, Louisianna; Ocala, Florida and Timmonsville, South Carolina have banned the style. This criminalization of blackness was explored extensively in Michelle Alexander’s book, “The New Jim Crow,” where she argues that mass incarceration and policing are nothing more than a form of racialized social control. Demonstrations on the SDSU campus are about more than just one arrest, one person or one video. The arrest of Campbell takes on new urgency when considered in the context of the wider issues of policing. Individual officers are not entirely at fault. The climate within which they operate and the systems of control they enforce is. Would there have been protests had Campbell been white? It is difficult to say. Perhaps not. Would Campbell have had the police called on him if he had been white? Again, it is difficult to say. Perhaps not. SDSU Police said they approached Campbell after receiving reports he had jumped a construction fence and was believed him to be intoxicated. However, Campbell has not been charged with either offense. Civil rights activist DeRay Mckesson was concerned but unfazed upon viewing Campbell’s arrest video. 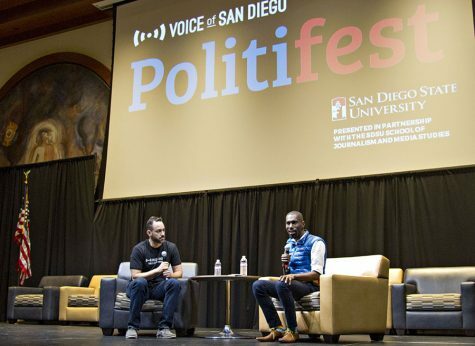 Civil rights activist DeRay Mckesson discusses issues of police violence with Voice of San Diego CEO and Editor-in-Chief Scott Lewis. “It is a disappointment those officers are still employed by the university,” Mckesson said after being shown the video during a Q&A session with SDSU JMS students Saturday. All of Campbell’s current charges stem from his reaction to the officers’ attempts to arrest him. African-American students have the same right to feel protected on campus as everyone else, and the actions of the SDSU Police only reinforce the negative reputation they already have with many people of color. It is difficult to find justification in Campbell’s prosecution. If the District Attorney’s office does not have a case for the crime that allegedly led to Campbell’s arrest, whose interests are served by furthering his ordeal? The disruption and pain his arrest has caused on campus is the far greater crime. District Attorney Bonnie Dumanis should act in the public good. In this case, the greater public good is in dropping the charges against Marquis Campbell.